the same software for old IBM PC. We succeeded to reproduce IBM PC on a FPGA board. This SoC is an IBM PC Compatible system which can run the same software for old IBM PC. This SoC contains an x86 softcore processor and other peripheral modules written in verilog HDL and is capable of running general purpose operating system. This runs on a Digilent's Nexys4, Nexys4 DDR and Terastic's DE2-115 board. This system is based on ao486. ao486 is also FPGA-based SoC which runs general purpose OS. It is released as open source at GitHub: https://github.com/alfikpl/ao486. We use several ao486 modules for this system: processor, VGA controller, PS/2 controller, PIT, RTC and HDD module. We newly wrote BIOS loader module and bus module in Verilog HDL in order to replace Altera's NIOS II and Avalon bus in ao486. 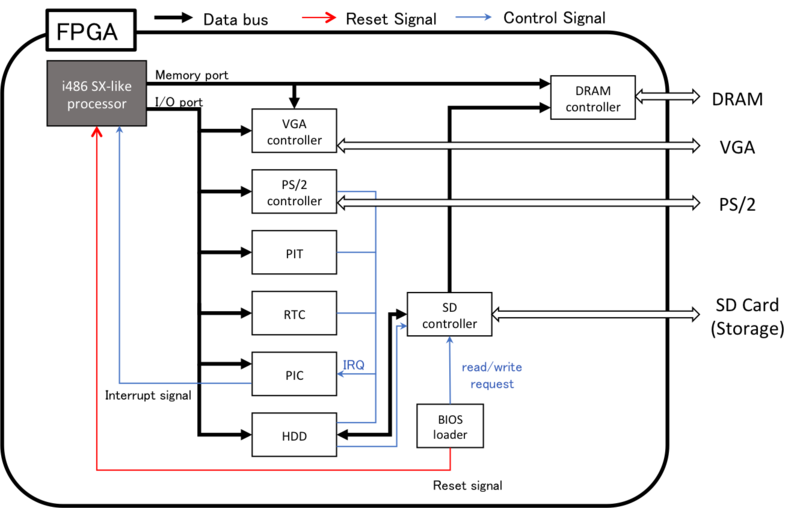 The system block diagram is shown left. If you want to run and handle our SoC, click following button and view tutorial to get started. Our SoC is released as open source with BSD Lisence. You can get the SoC at GitHub page of Frix. You can get the example HDD image by clicking the button below. This SoC is explicated in a conference paper of MCSoC'15.